Coming to the end of flight and certification tests, programme. The Antonov An-70 is a next-generation four-engine medium-distance transport aircraft, and the first large aircraft to be powered by propfan engines. Developed by Ukraine's Antonov design bureau to replace the obsolete An-12 military transport, work on the An-70 began in Soviet Union in the early 1990s. The maiden flight of the first prototype took place on December 16, 1994 in Kiev, Ukraine. Russia and Ukraine had as of 2002 agreed on a 50–50 risk-sharing deal on production. Particularly, there were plans to establish serial production of the model in both Kiev and Samara, Russia, guaranteeing employment of about 80,000 people in the two countries. The Russian government had shown interest in purchasing 160 planes for its military. The first prototype was lost in 1995 in a mid-air collision with an Antonov 72 chase plane. The second prototype suffered damage in a 2001 emergency landing during cold-weather testing in Omsk Russia, but was repaired. Soon after the first crash, Russian authorities started to question the An-70's abilities and demanded further development. In May 2005, senior Russian Air Force officials claimed that bilateral development and further testing of the plane continue, though inside sources (Piotr Butowski) reported that the An-70 was rapidly losing ground to the upgraded IL-76MF, with the Tu-330 and Il-214 coming up strongly on the outside. In November 2005, Ukraine's Defence Ministry announced plans to buy five An-70s for the Ukrainian Air Force. 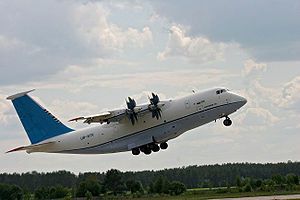 In December 2005, Antonov maintained that production of the aircraft remains a priority. In April 2006, Russia announced its complete withdrawal from the project. The head of the Russian Air Force, Vladimir Mikhailov, claimed that the An-70 has grown into a heavy, expensive cargo plane. The Russian military plans to use the Ilyushin Il-76MF, which reportedly costs half as much as the An-70. After the Orange Revolution in late 2004, and with Ukraine openly aiming for NATO membership, political will for the project evaporated. Russia has provided around 60 percent of the estimated $5 billion invested in the project to date. As of 2008, testing of the An-70 continues. Serial production could begin in a year and a half. A turbofan-powered derivative is also under development for China, reportedly to be named An-70-600. Fully fly-by-wire, the An-70 features a glass cockpit with all electronic instruments, and uses composite materials throughout. Powered by four Progress D-27 propfan engines, each turning a pair of contra-rotating scimitar propellers it can reach 90% efficiency in cruise at jet speeds.